Oh no, asparagus. Who can say they really like this vegetable? In years past, I’ve been served a mushy and overcooked version of asparagus. Probably canned, too. But one day, I learned the trick to cooking asparagus by accident. 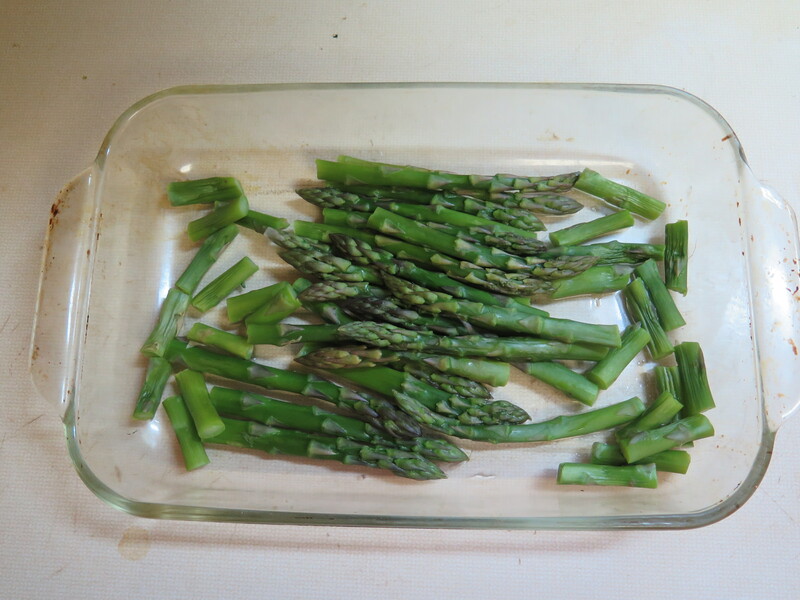 While making an appetizer, I barely blanched the trimmed asparagus stalks in the microwave — not knowing how long it would take to cook the stalks. They came out crisp and bright green. Wow, these were great and they didn’t look or taste like the same vegetable that I had been served all these years. This recipe is a good one to serve in in the springtime — sort of a refreshing start to the new year. Small red potatoes are plentiful in stores in Louisiana at this time of they year because these small potatoes are boiled along with the whole crawfish at “crawfish boils.” I try to purchase the smallest red potatoes that I can find when shopping. Add in fresh asparagus and a few seasonings such as celery, green onions (from my winter garden) and dill seed (also from my garden). This becomes a very quick and tasty potato salad. What is the nutritional value of asparagus? It is low in calories, of course, and contains many vitamins. I was interested to see that this vegetable has an abundance of folic acid. This vitamin helps prevent anemia, helps produce DNA and helps with normal cell functioning. Of special note, folic acid helps prevent neural tube birth defects (including spina bifida) in pregnant women and lowers homocysteine levels which is an inflammatory molecule linked to the development of heart disease in certain susceptible people. Asparagus has an abundance of phytonutrients — a class of nutritional compounds being studied for immune properties and antioxidant properties. Asparagus also is high in Vitamin K — important in clotting mechanisms — so use this vegetable with caution if you are on a coumadin regimen. Folic acid It is also used for reducing harmful side effects of treatment with medications such as methotrexate and some anti-convulsive drugs. Because of it’s role in DNA and protein generation, folic acid has been studied in relation to many diseases. Clearly, it is an important vitamin. Although cereals and grains are now fortified with folic acid, it is important to include other food sources of folic acid in a person’s diet. So, now there is a good health reason to eat asparagus! The key to cooking asparagus is to just barely blanch the stalks in a little water. When finished, they should still be crisp. I was taught to set the stalks upright in a pot of water and boil. This way the tougher stems at the bottom of the pot were cooked longer and everything turned out evenly cooked. But it is difficult to judge how long to cook the asparagus and to find a small pot for this task. I’ve found a simpler method which works for me every time. I used only the top half of the stalks which are the most tender ones and place these in a microwavable-proof dish with the tips pointing to the center of the dish. I’ll sort through the stalks and add additional ones that are small and green. Add 1/4 cup water and cover loosely with wax paper or plastic wrap. Blanch in a microwave oven for 5 minutes — no longer. Remove, drain off the hot water and add ice cubes to chill. Then cut into one inch pieces, if desired. This works every time. Don’t overcook, is the message here. One pound of asparagus as purchased usually yields about half a pound when trimmed. Alot of wastage? Yes, but the stalks are too tough to use in a salad. If you are ambitious, use the discarded stalks in a soup for a flavorful stock. If I double the amount of asparagus cooked, I really only increasing cooking time by one or two minutes — I don’t double the cooking time. Alot of the cooking time is in boiling the water — you may have to experiment. The dressing for this salad is simply mayonnaise thinned with a little vinegar with dill seed added for seasoning. Apple cider vinegar? Yes, it thins down the mayonnaise so the dressing can be poured. A tasty dressing can also be made using 1/3 cup salad or olive oil, 2 Tbsp cider vinegar, 1 Tbsp Dijon mustard and 2 tsp dill seed if you prefer not use use a mayonnaise-type dressing. 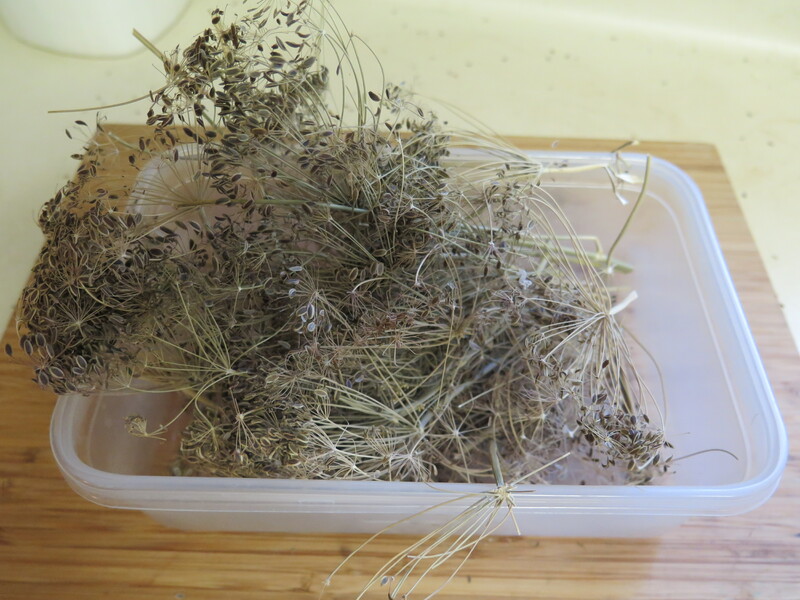 The dill seed is from dill plants which grew in my garden last spring. Dill is an easy herb to grow in Louisiana in the cool weather. One plant makes alot of seed heads. I cut the seeds pods leaving them attached the stems. These are stored in a covered container on top of my refrigerator (where it is dry). The dill retains its pungent flavor for at least a year. Simply shake off a teaspoon of seeds whenever the recipe calls for dill. 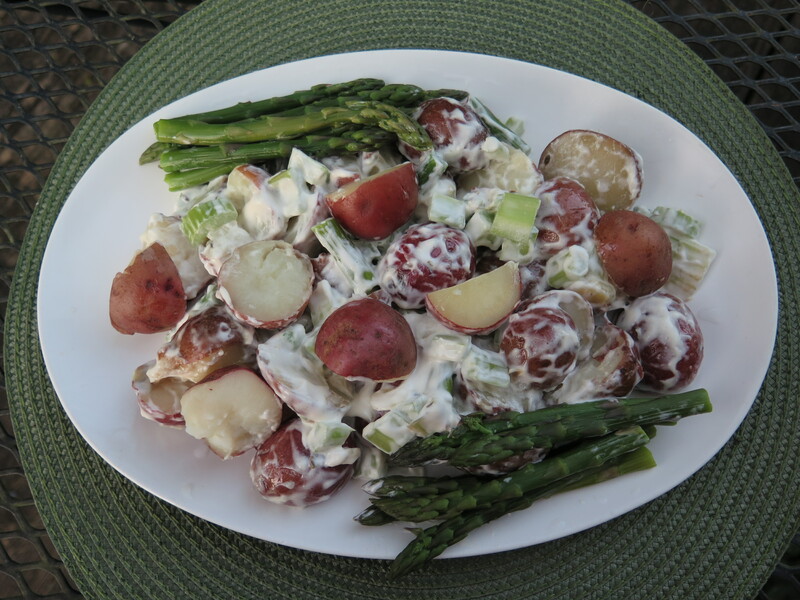 I have served this potato salad with asparagus many times over the years. 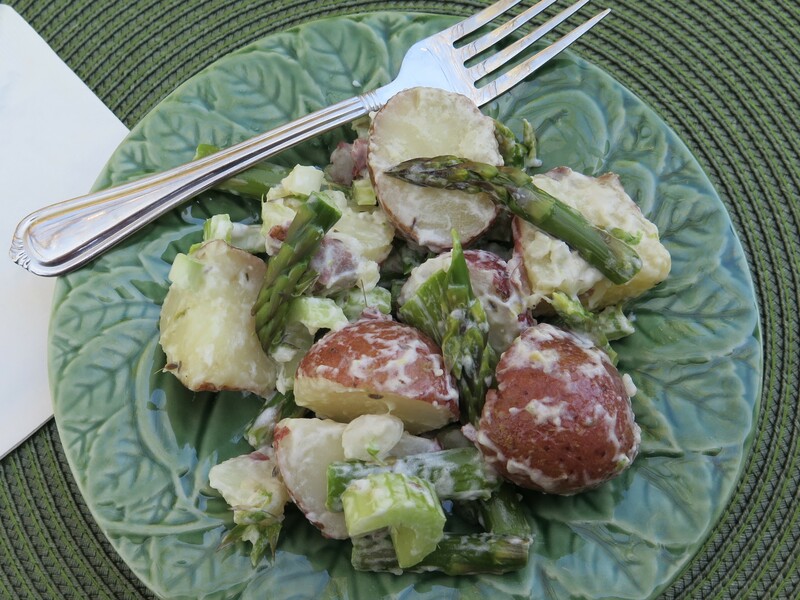 The original recipe was in a “Cooking Light” Magazine, from March/April 1988, called “Springtime Herb Potato Salad.” (I save every good recipe.) 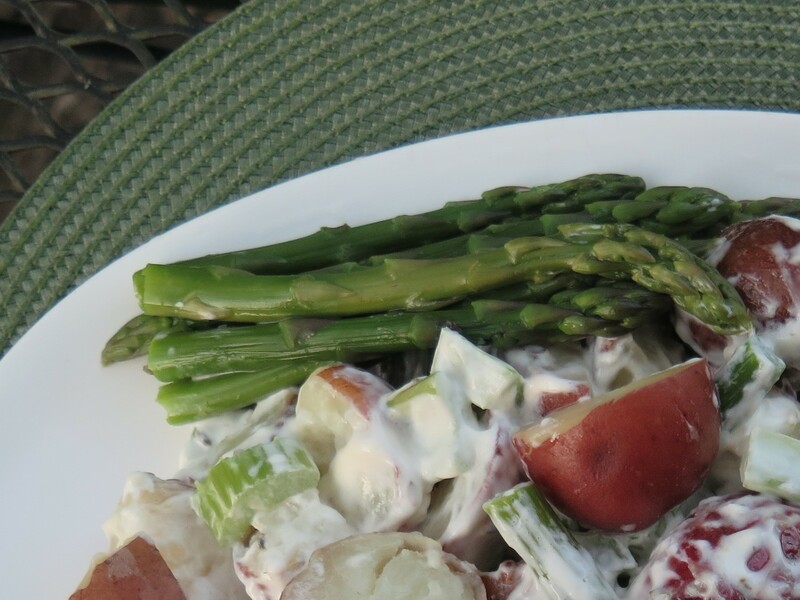 I’ve adapted the ingredients and quantities substantially as time has gone by but red potatoes (sometimes called new potatoes if it is the beginning of the harvest season) and asparagus are always included. Enjoy these flavors of the new spring. Although I have listed the number of servings as “6 to 8”, my husband and I can perhaps finish this in two meals, taking second helpings. If you are a new asparagus lover, this might not last long. Add red potatoes to large pot and add water to fill to 1″. Salt potatoes. Bring to boil, cover and reduce heat on stove to medium-high. Gently boil for approximately 20 -25 minutes until the potatoes are tender (cooking time depends on size of potatoes). Drain in colander and cool to room temperature. Set aside. Meanwhile, trim top half of asparagus stalks. Place tops in microwavable dish with tips pointing towards center of dish. 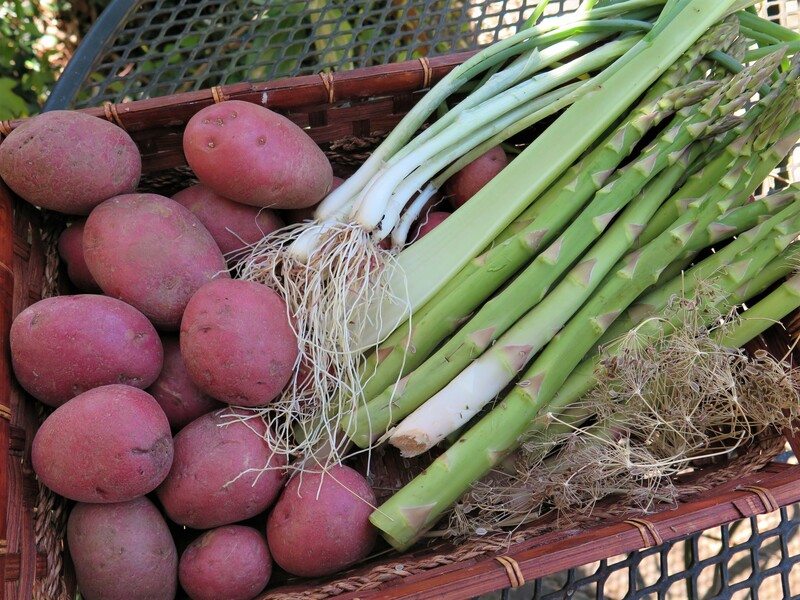 Add additional 1″ pieces of small tender stalks. Add 1/4 cup water and cover loosely with wax paper or plastic wrap. Place in microwave oven and microwave on high setting for 5 minutes. Remove from microwave oven, drain off hot water, add several ice cubes and cold water to quickly chill. Drain. Reserve several stalks for garnish and cut remaining stalks into 1″ segments. Set aside. When potatoes are cooled, cut small potatoes in half and add to large bowl; cut larger potatoes into quarters. Add chopped asparagus, diced celery and sliced green onions. Make dressing by combining mayonnaise, vinegar and dill seed. Combine thoroughly with wire whisk or spoon..
Pour dressing over potato and asparagus combination. Gently toss to coat the potatoes and asparagus. Cover and place in refrigerator and chill. 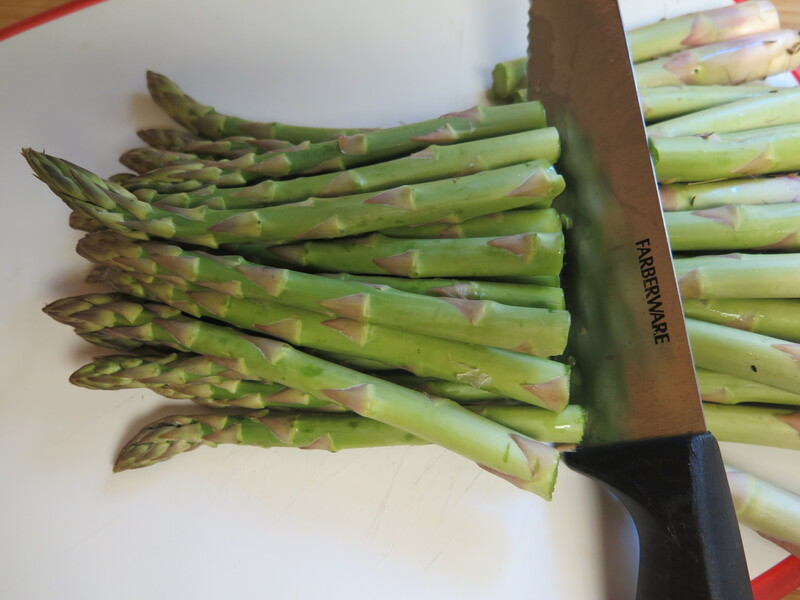 When ready to serve, place in serving bowl adding reserved whole asparagus stalks along the sides. When you cross the Mississippi River from Baton Rouge to West Baton Rouge Parish you quickly enter a very rural area of the state. 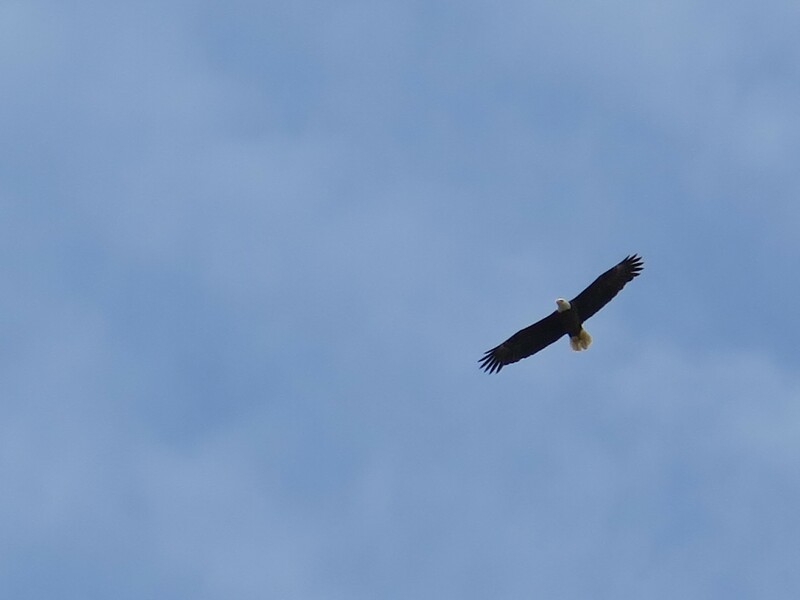 Just across the river bridge and a little north of the sleepy neighboring town, we discovered a Bald Eagle and nest with 3 babies along the levee of the Mississippi River. 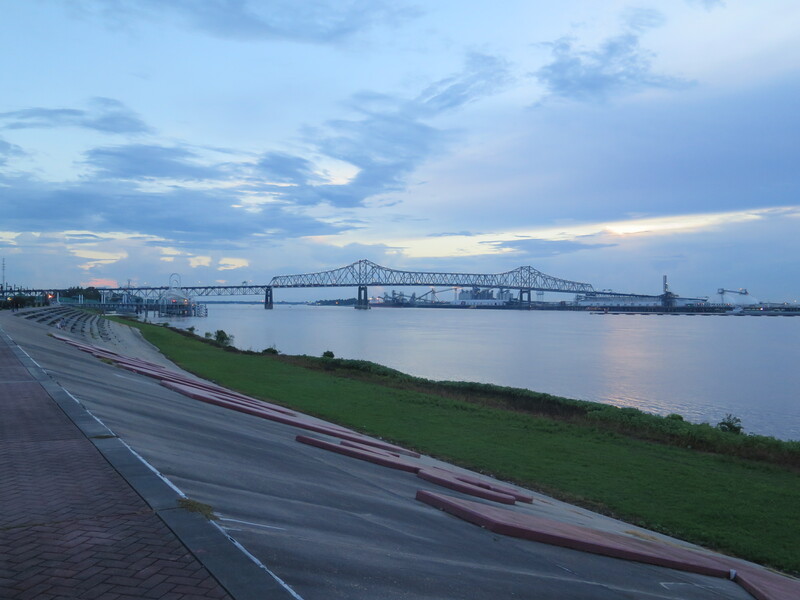 Couldn’t be more than a 3 – 4 miles from the city of Baton Rouge. 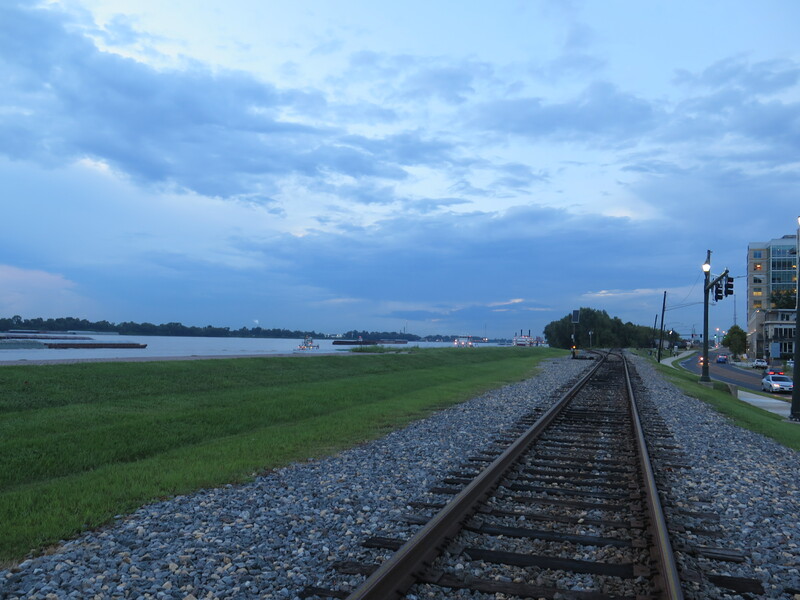 I took this photo facing the levee (the Mississippi River is just beyond the levee) with my trusty Canon digital camera (same one that I use for food photography). Look closely to see the nest and also the eagle soaring high in the sky. 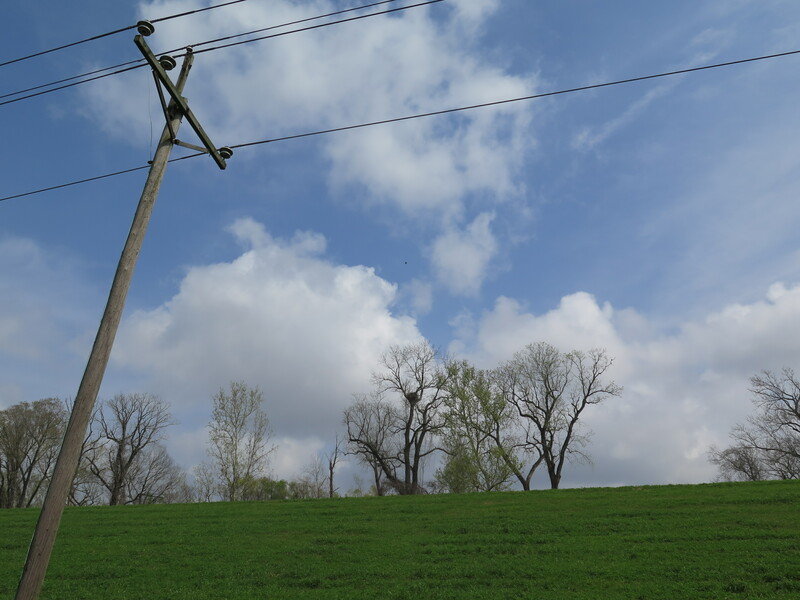 When you turn around with your back to the levee, here’s the view. It is springtime in Louisiana. Wonder what the eagle sees? 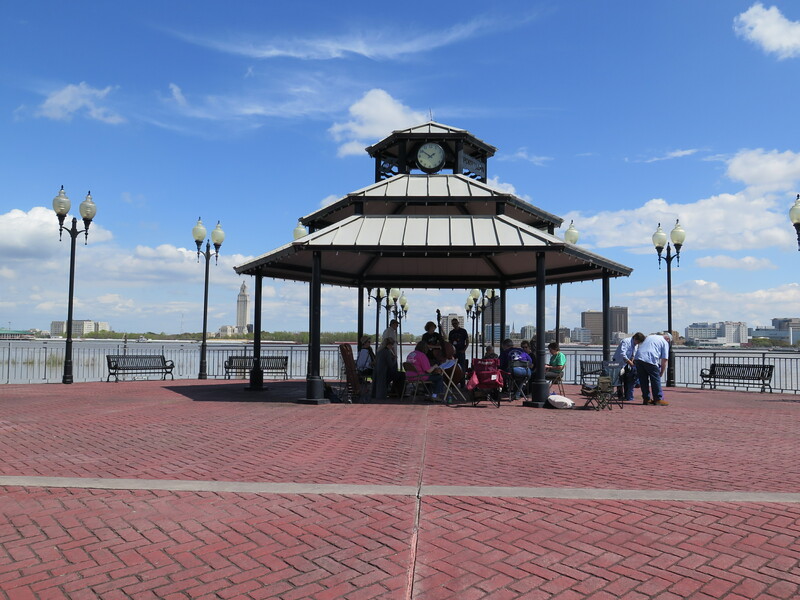 He might watch us having a bluegrass-dulcimer jam just a few miles away from his nest on the Port Allen river landing with Baton Rouge in the background. Can you identify Huey P Long’s state capitol building? 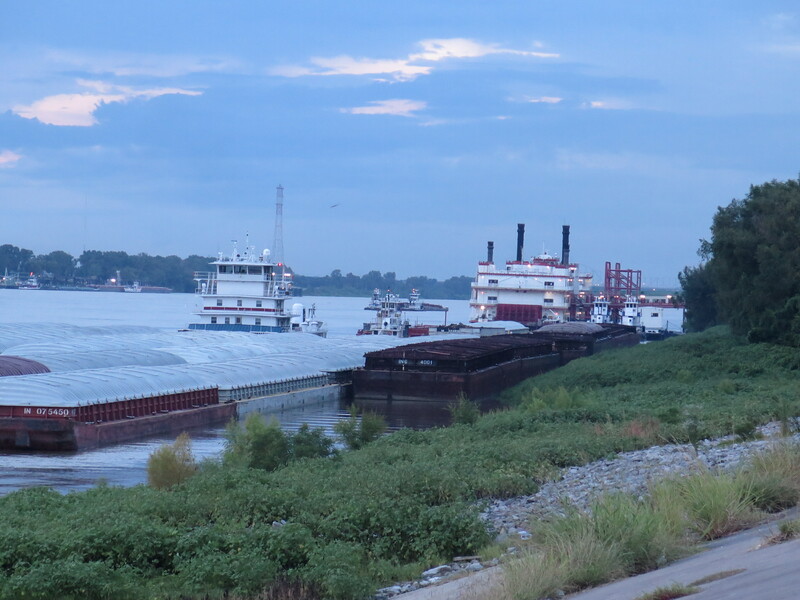 Or the eagle might watch the barge traffic on the Baton Rouge side of the river. Somewhere in the distance is the eagle’s nest on the far side of the river. And back home; here are my neighbor’s beautiful azaleas. They put on quite a show this year. Spring has arrived! 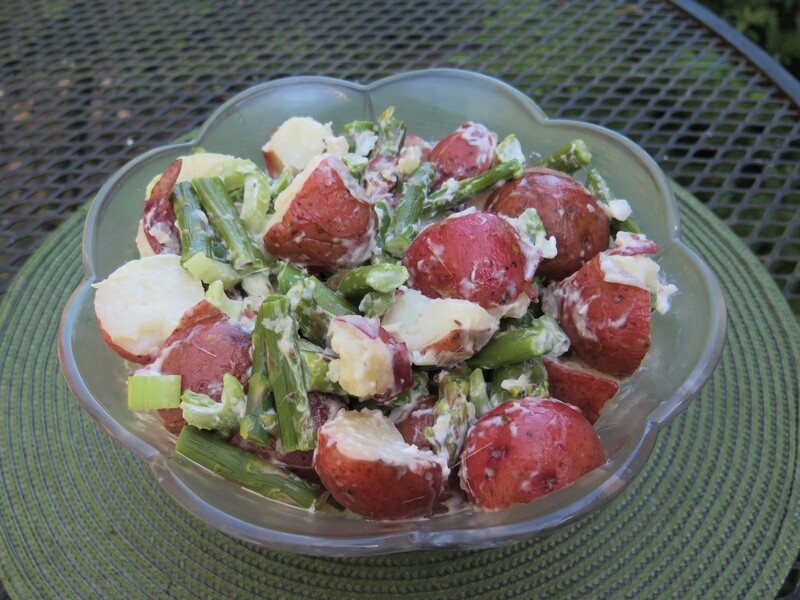 This entry was posted in Louisiana garden, Recipes and tagged asparagus, Bald Eagle, healthy salad, red potatoes by Maylee at Beyond Gumbo. Bookmark the permalink. 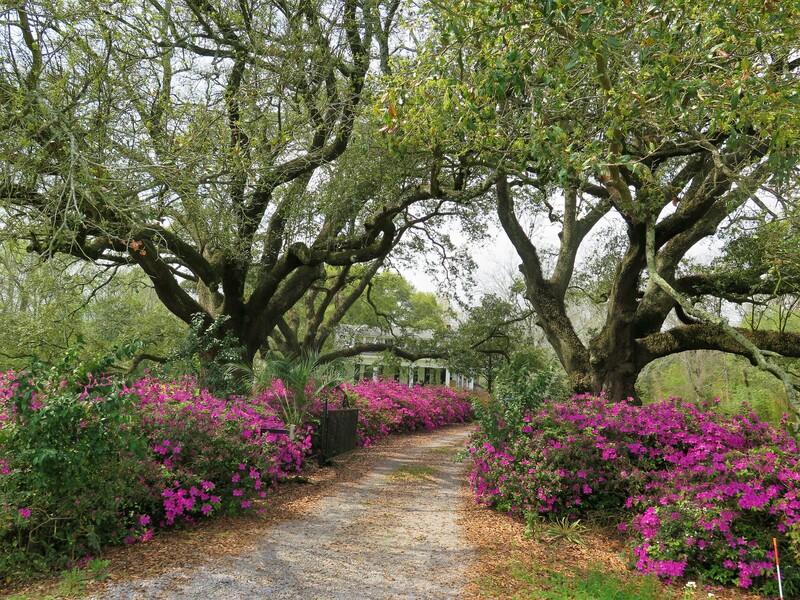 Those azaleas are gorgeous! I honestly just say that salad and stopped and put potatoes on to boil! It looks delicious and I just bought some new potatoes and asparagus. Thanks for sharing!! 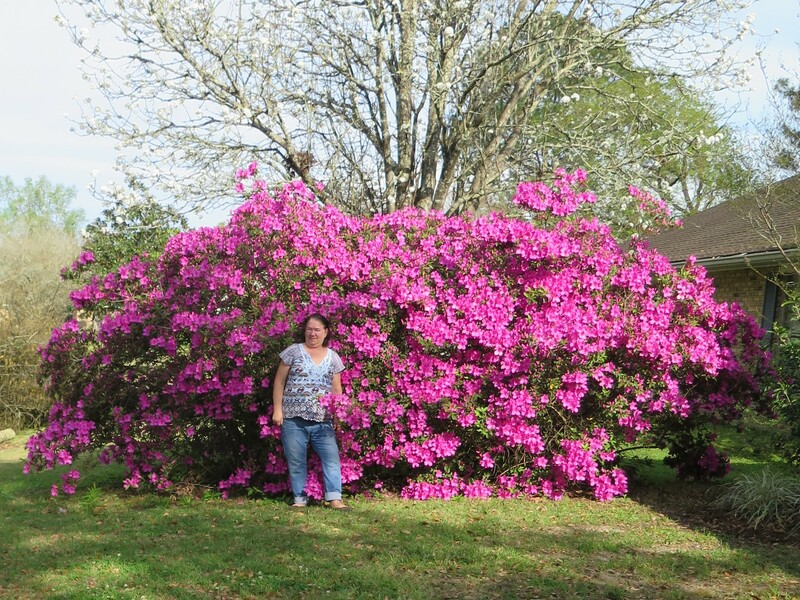 Yes, I pray every year that my neighbor won’t cut down those azaleas — they are the prettiest one’s I’ve ever seen. Hope you enjoy the recipe.